Your First Bodybuilding Competition! Are You Ready For The Stage? Have your ever thought about entering a bodybuilding competition but have no idea what to expect? Check out this comprehensive guide to preparing for a contest! The more bodybuilding knowledge that you have the more progress you will make. Try watching a competition first so that you can see what you can expect. When posing make sure to highlight your strengths and hide your weaknesses. 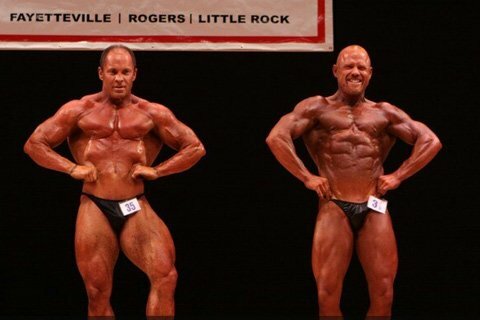 After many months or years of pounding away in the gym you may wish to compete in a bodybuilding contest. In this article I'll cover some information about competitive bodybuilding that will help you prepare for your first contest. Of course not everyone is interested in competition. In fact the vast majority of people in the gym have no intention of competing. But for those of you who do want to compete in the future, this article is a must read. For information about local bodybuilding contests check with the gyms in your area. Most provinces or states have several bodybuilding contests each year. The best position for your first bodybuilding contest is the audience. It makes little sense to get on stage without learning the finer points of the sport. There is much more to a contest then just getting up and hitting a few poses. Most competitors will admit that preparing for a contest is like a second job. Bodybuilding contests are divided into two phases, the prejudging and the evening show. The prejudging is all business. It is usually in the morning, this is like a rehearsal of the evening show. It gives the judges an opportunity to evaluate the competitors without the distractions of a large audience. As a future competitor you will definitely need to attend the prejudging. In most cases the judges choose the winner in the prejudging. By attending the prejudging you will learn what is expected of the bodybuilders onstage. Men do seven compulsory poses and women do five. Sometimes the individual posing routines are left out of the prejudging and only performed at the evening show. Your posing ability and routine are very important. Posing can make or break your chances of winning the contest. Men Do Seven Compulsory Poses And Women Do Five. The evening show usually starts around 7 p.m. It is similar to the prejudging except there will be a much larger audience. 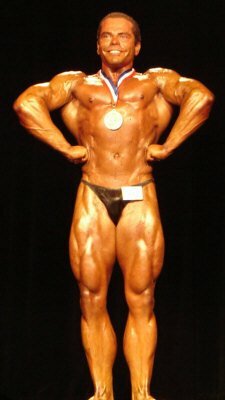 The symmetry round, compulsory poses, comparisons, and individual posing routines are the same as in the prejudging. After the judges have made their decision, the show ends with the "pose down". This is where the top competitors do freestyle posing together onstage. After the pose down the judges announce the placings and award the competitors their trophies and medals. You have to choose a contest that is most applicable to your physique level. If you are a teenager then you can enter the teenage or junior division. Some shows also have "Novice" division for first time competitors. Although there may be exceptions, most bodybuilding contests are broken down into weight divisions. Most competitors try to compete at the top of their weight class. It is better to compete as a "ripped" middleweight then compete as a "smooth" light heavyweight. You will make a far greater impact on the judges by competing ripped and in top shape, then appearing smooth and bulked up. Applicable To Your Physique Level. There are usually anywhere between 5-9 judges (both male and female) that judge a bodybuilding contest. Each judge has been evaluated and certified. Contests are scored using a ranking system. After each round, the judges rank the competitors from first to last. At the end of the contest the competitor with the lowest score wins. This system means that a competitor doesn't have to win every round, but have the lowest overall score. This round is where you will make your first impression on the judges. You'll be asked to stand facing the judges with your hands at your sides. Even though this is called "standing relaxed," Do not relax! You must keep your muscles tensed and under control at all times while you are on stage. The judges may be looking at you at anytime so you need to be ready. You don't realize how hard posing is until you have done it. And I don't mean hit a 5 second pose. I mean standing semi-flexed for 10+ minutes. Your heart rate will go up, you will sweat, and may even begin to have muscle cramps. The judges will ask you to "quarter turn to the right", you will turn 90 degrees to the right and let the judges view your physique from the side. Keep your entire body tensed and tight at all times. Then the judges will ask you again to "quarter turn to the right", you will be facing back on to the judges and they will view your physique from the rear. Make sure to tense your back and legs. Then you will be asked again to "quarter turn to the right", you will be side on to the judges and they will view your physique from the opposite side. Keep your muscles tensed and your abs tight at all times. Then the judges will ask you to "quarter turn to the right", you will be facing the judges and they will have one final analysis of the competitors. Although muscles size is taken into account during the symmetry round, the judges are primarily looking at symmetry, proportion, and definition. Even Though This Is Called "Standing Relaxed," Do Not Relax. This is where you really get to show the judges your development. This round consists of 7 compulsory poses; each designed to show the judges different aspects of your physique. You must have these 7 poses down pat before you step on stage. *Women do NOT have to do the Front and Back Lat Spread. During the compulsory round you are compared with your competitors. The judges usually call out 2-3 competitors and have them run through the seven compulsory poses together. Then the judges will call out another 2-3 competitors and have them run through the compulsory poses. They will continue this procedure until they have all of the competitors ranked from first to last. There are two ways to do this pose, with a stomach vacuum or with your abs flexed and crunched. The vacuum method allows for a broader shoulders base and lat spread, while the abdominal crunch method is impressive if your midsection is ripped. Practice both ways and do the variation which you feel makes you look the best overall. You should hold your arms in such a fashion as to give each arm an equally balanced look. If you're biceps are less than perfect, try holding your forearms at almost right angles with your elbows and fully twist your wrists to bring out the biceps peak. It is usually more impressive when the upper arms are slightly above parallel with the floor. Tense Your Legs While Doing This Pose. To get a full lat spread, you must learn not to shrug your shoulders, but to hold them down. This will make your lats look fuller and make you look bigger. While pushing your fists against your sides, attempt to pull your shoulder blades apart and spread your lats outward. To make this look good, you will have to have great scapula flexibility. After practice and some stretching you should be able to perform this move precisely, spreading your lats to their full potential. As with the front double biceps you can do this pose with a stomach vacuum or with your abs flexed and crunched. The vacuum method allows for a broader shoulders base and lat spread, while the abdominal crunch method is impressive if your midsection is ripped. Practice both ways and do the variation which you feel makes you look the best overall. Make sure to bend your knees slightly and tense your legs while doing this pose. Your Shoulders, But To Hold Them Down. With this pose there are a couple of different leg positions that you can use. Choose the position that makes you look the best. One position requires your back leg (away from the judges) to be held relatively straight and bent only a few degrees at most. While your front leg will be bent with your toes pointed and calves flexed. The other position is as if you'd been frozen halfway through a forward step. Your back leg is slightly bent and behind the torso. Your front leg is slightly bent and in front of the torso. Make sure to tense your leg muscles. No matter which leg stance you choose, the upper body portion of this pose will be the same. The only difference would be which side of the upper body is used. For the left side, simple reverse these instructions. Expand your rib cage and chest. Bend your right arm at 90 degrees with your palm facing up making a fist. Keeping your right arm pressed against your side (especially your upper arm) will give that arm an even more massive appearance. Meanwhile, your left arm should extend across your abdomen grasping the wrist of your right arm with your palm facing down and pushing against your body. Flex everything in this position. Choose The Position That Makes You Look The Best. As with the side chest, there are a couple of different leg positions that you can use for this pose. Choose the position that makes you look the best. One position requires your back leg (away from the judges) to be held relatively straight and bent only a few degrees at most. While your front leg will be bent with your toes pointed and calves flexed. Extend your right arm down your side, reach behind your back with your left arm and grasp your right wrist. Keep your left palm toward the rear. With your arms anchored in this position, you will be able to pull your muscles to bring out the bulk and definition of your triceps, shoulder, and chest. Experiment keeping your right arm perfectly straight and rotating it in different directions to bring out different striations on your delts and triceps. Keep your right triceps pressed firmly against your side to flatten and widen the muscle, making it look larger. You should keep your stomach tight and expand your chest. Remember To Keep All Of Your Body Flexed. The back double biceps pose is similar to the front double biceps pose except for a few important differences. Your calves and hamstrings have to be flexed. It will not look good if you get the top half of your body right and the bottom half is relaxed. Your arms should be pulled back toward the judges as well as your wrists. Your elbows should be more frontward (away from the judges) than your hands. With your spine rounded, your shoulder blades should be spread and your back muscles should be flexed. To really bring out the lower back, tense your abs. You can turn your head from side to side to show the muscles of your trapezius. Remember to keep all of your body flexed. Body Right And The Bottom Half Is Relaxed. The back lats spread is similar to the front lats spread. The only difference is that you round out your torso, so that it's forward, while pulling your elbows ahead of the midline of your torso. An effective way to start this pose is with your lats originally crunched together. When you pull them apart to expose your entire lat spread, it is a more dramatic way of going into the pose. Your calves and hamstrings have to be flexed. It will not look good if you get the top half of your body right and the bottom half is relaxed. Remember to keep all of your body flexed. Your Calves And Hamstrings Have To Be Flexed. Put your strong leg about one foot in front of the other. The toes of your back foot should angle outward, while your front foot's toes point forward. With your front leg tensed, flex your quads and calves to bring out your muscle definition. Different bends and angles will bring out various muscles better. You can switch angles mid-way through the pose if you like. With an interlocking grip, place your hands behind your neck and angle your arms upward. Flex your biceps and chest, while strongly tensing your abdominal region. This will make you look quite impressive. Keep flexing it all thoroughly and be sure to stand as straight as possible. Remember to keep all of your body flexed. Sure To Stand As Straight As Possible. In a close contest the free posing routine can be the difference between winning and losing. 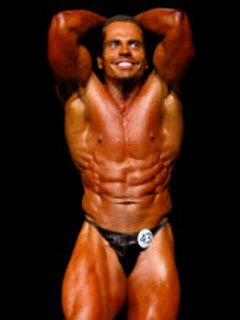 With a good posing routine you can win the audiences approval and they will start screaming your name or number, and in a close contest the judges often vote based on the audiences response. The first step to creating a great posing routine is picking the music. You must choose music that suits your physique. Some of the larger heavyweights like to use powerful classical music, but most likely that wouldn't suit a lightweight or middleweight. Some people like to use upbeat dance type music. This is good for posing to and it can really get the audience involved. Another type of music that is often used is heavy metal. You need a powerful physique to match with the powerful music. If you have trouble picking what type of music to use in your routine, you should listen to a wide variety of music and picture yourself posing to the various songs on the radio. Eventually a song will catch your attention and then you can build your routine around it. You Need A Powerful Physique To Match With The Powerful Music. At the amateur level posing routines are usually 90 seconds in length. Get your music copied onto a CD by itself with no other music on the CD. Write your name and competitor number on the CD with a permanent marker. You'll usually pass your music into the contest officials at the weigh in. Also make a note on your CD to let the music man know if you would like to have your music start before you step on stage or when you are center stage. Make a back up copy of your music and keep it with you backstage. If anything happens to your original CD, you'll always have a backup. You should watch as many bodybuilding shows as possible. Record contests that come on T.V. or order contest videos and watch them over and over again. This will help you to visualize your own routine. If you can, try and get help from an experienced competitor. Be creative and design a routine to highlight your strengths and hide your weaknesses. The purpose of a posing routine is to show your physiques strong points, hide your weak points, and entertain the audience and judges. Emphasize your strong points early in your routine to get a good first impression. Organize your poses so that you can move smoothly from one pose to the next. Generally you start with a few front poses, move to a couple side poses, and then move to a couple back poses, etc. Practice your routine over and over until you can do it in your sleep. Start practicing your routine at least 6 weeks before the contest. Make sure to pace yourself. Often you see novice bodybuilders rush their routines and get ahead of their music. Take your time when onstage. Hit a pose, hold it for a couple of seconds, and then smoothly move into another pose. It is a good idea to bring a headset and an extra CD of your music with you to the bodybuilding contest. Find a place backstage by yourself where you can rehearse your routine so it is fresh in your mind before you have to go out an perform in front of the judges and audience. Always appear confident onstage. Smile as much as possible and make eye contact with the judges and audience. Keep your head up, maintain perfect posture at all times, including walking on and off the stage. Keep your muscles tensed at all times while onstage. There will be plenty of time to relax after the show, during the contest give it your best. Unlike the first 3 rounds where your poses are arranged and your routine is rehearsed. The posedown is made up on the spot. 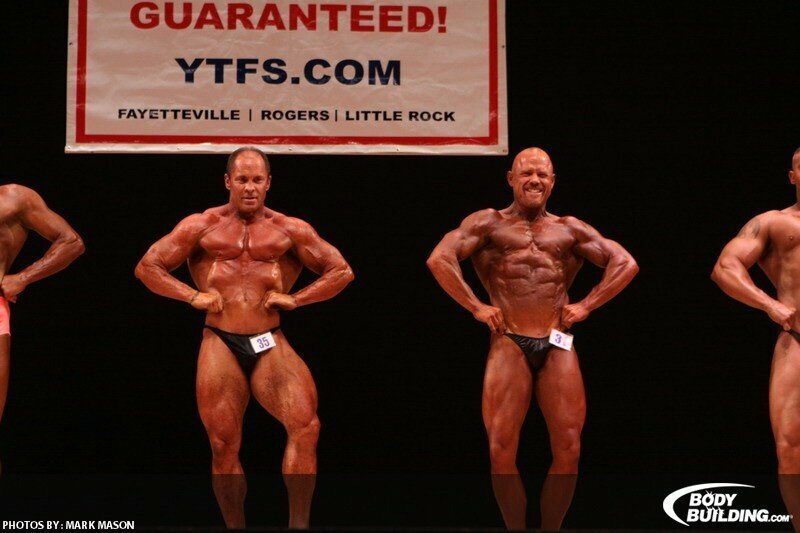 The posedown usually involves 3-5 of the top competitors. You will all line up onstage and then the judges will tell you to pose down and hit your best poses. It is difficult to prepare for a posedown but there are some strategies to help give you the edge. For example, if your opponent has strong arms and your arms a weak do not compare arm poses together. When you opponent hits an arm pose you should do another pose such as abs and thighs, etc. The idea is to offset their strong points with your strong points. However, if your opponent does a side chest pose and you have a strong side chest pose stand there and accept the challenge. Similar to the free posing routine you want to emphasize your strong points and hide your weak points. Similar To The Free Posing Routine You Want To Emphasize Your Strong Points And Hide Your Weak Points. Male bodybuilders usually need to lower their body fat to 5% or lower in order to get "ripped" and women need to lower their body fat to 10% or lower. This is unhealthy if such a low bodyfat percentage is maintained overtime. You should strive to "peak" for the contest and then gain a little body fat afterwards to be strong and healthy. The goal is usually to gain as much muscle mass as possible during the off-season and then shed the excess bodyfat while maintaining muscle mass during the pre contest. 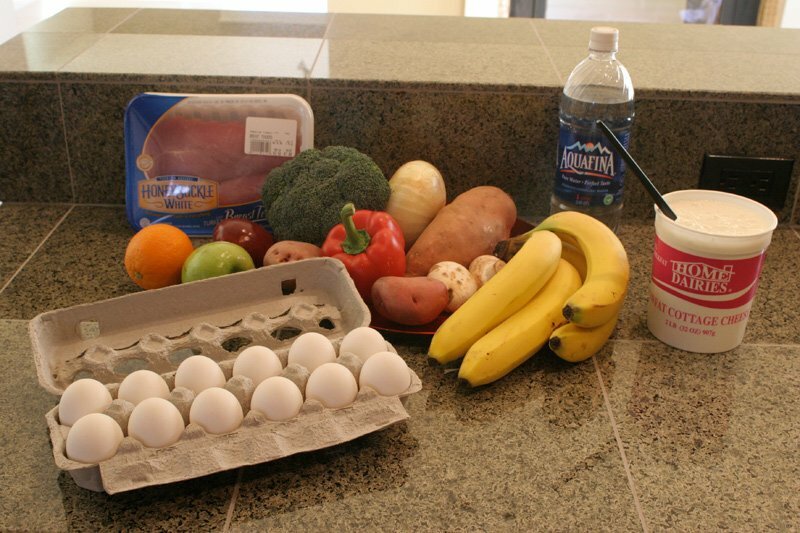 Most bodybuilders today try to keep within 15-25 lbs. of the contest weight. A lightweight should not have to lose more then 15 lbs. to make his weight class. And a heavyweight should not have to lose more then 25 lbs. to make his weight class. If you fall within the above ranges then you should start your pre contest diet 12 weeks before the contest. This allows you enough time to lose 1 - 2 lbs. per week without losing hard earned muscle mass. If you have more body fat to lose, then you'll have to start your diet earlier to give yourself enough time to get in contest shape. If You Have More Body Fat To Lose, Then You'll Have To Start Your Diet Earlier To Give Yourself Enough Time To Get In Contest Shape. Around 8 weeks out from the contest you should shave off your body hair. This will allow you to accurately evaluate your physique and exactly what kind of condition you are in. It is hard to see how lean and muscular you are if you're covered in body hair. For guys who have never shaved before it is a good idea to use hair cutting clippers to get rid of the majority of the body hair first. Then use a razor to get rid of the stubble afterwards. Shaving is quite time consuming, it could easily take a large competitor 2+ hours to shave off all their excess body hair. Then keep it off by re-shaving weekly. It takes a bit of practice, you don't want to nick yourself before the show. The first time you put on a pair of posing trunks can be a bit intimating to say the least. Most trunks have only enough material to cover the "essentials". But the high cut posing suits will reveal muscularity in the hips and legs and look better on stage. Can Be A Bit Intimating To Say The Least. During the last 6 weeks before the contest you should be tanning regularly to build up a good base tan. On Friday morning before a Saturday show you need to start applying Pro Tan. This is a paint on self tanning product that will give you a deep dark colour. The darker you are, the more muscular you will appear. You'll need to apply at least 6 coats of Pro Tan in order to get dark enough for the bright stage lights. A lot of competitors will also choose to use Dream Tan in addition to Pro Tan. Dream Tan is a dark moisture rich cream that you put on prior to going on stage. Dream Tan contains oil so extra posing oil is usually not needed when using Dream Tan. If you are going to use Dream Tan make sure to get the Red / Bronze formula 2. This provides a nice deep dark colour on stage. Note: there are several other brands of bodybuilding tans available, but Pro Tan and Dream Tan are 2 of the most popular. This article has covered the basics of what's involved with a bodybuilding competition, but you should still contact your local bodybuilding association and talk to some experienced competitors. They can help you immensely when it comes to finer details of dieting, posing, and contest preparation. How To Start Your Own Competition Training Crew! 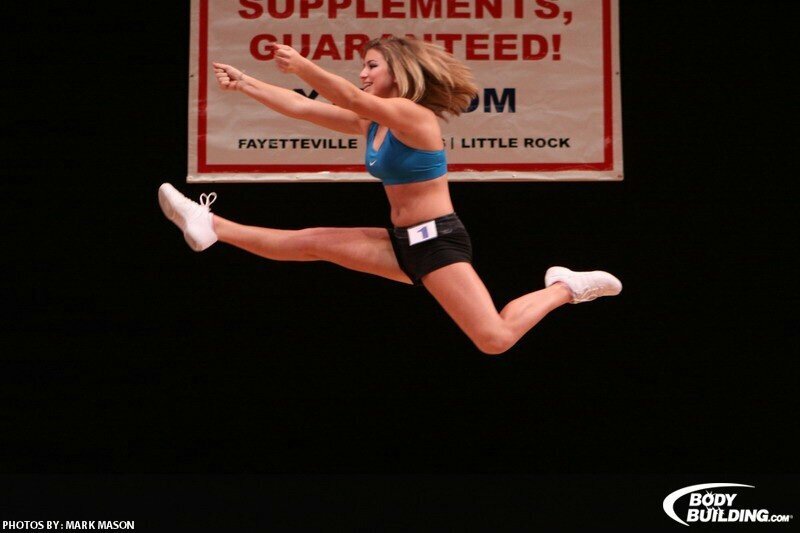 Competing for the first time is the experience of a lifetime! But you can only make it better by starting your own competition training crew! Find out how to connect with other fitness enthusiasts and skyrocket to victory together! Taking The Plunge: Tips For Your First Contest! When I entered the 1995 Newfoundland Provincials, I was 17 years old. 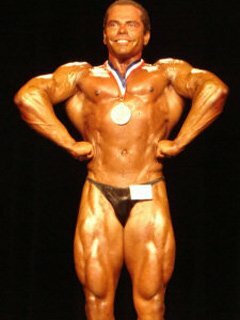 Since then I have competed almost every year in bodybuilding competitions.